Bizarre Guitar-Reno currently lists this STUNNING quilt top Fender Select Iced Tea Burst-- STUNNING, I say! But beyond the top, check out the quarter-sawn birdseye maple "channel-bound" neck, binding a rosewood fretboard. That rubbed oil finish neck is also a 9.5 - 14" compound radius with a modern contoured heel. Other modern features include HSS pickup config, 2-point trem and locking tuners. Classy and fast! 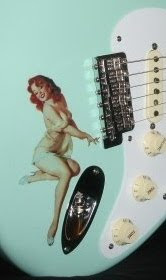 And those pickups are overwound, so we're also talkin' Sassy and FAT!